Description: Sexes similar. 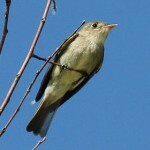 Olive above; yellowish below; yellow throat; proportionately short-tailed and big-headed. Broad yellow eye ring; black upper mandible, and lower mandible that is entirely pale orange. Grayish-brown tail; wings blackish with whitish or yellow wing bars; and underparts with a broad olive vest; lacks pale area between olive vest and yellow belly. Late-summer birds and fall migrants are grayer above and duller below. 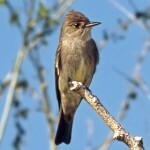 Habitat: Migrants can be found in second-growth woodlands. 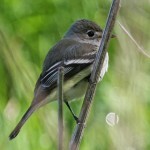 Usually nests in alder and willow thickets in boreal forest during the breeding season. 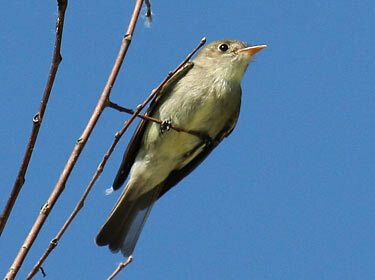 Where in Nebraska: Rare spring and casual fall migrant in eastern Nebraska. Field Notes: Breeding records are extremely unusual “extralimital,” or outside bird’s usual range, nesting records. Fun Facts: The Yellow-bellied Flycatcher winters in semi-open habitats of Central America, including coffee plantations.